Category: Piano Music. 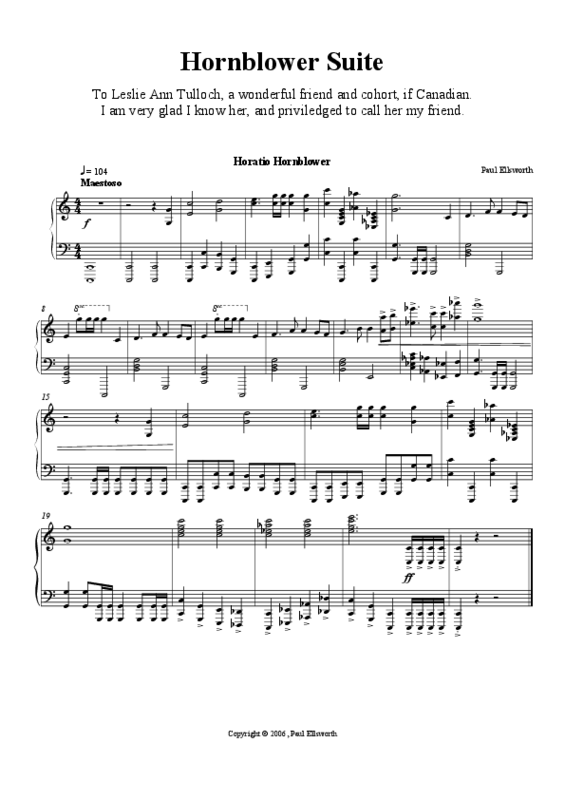 Tags: british, fugue, hornblower, piano. The Hornblower Suite was written after reading the series of books by C. S. Forrester. My good friend, Leslie Ann Tulloch, has a great affection for the books as well, so this programmatic piano piece was written for and dedicated to her. The work is broken into five movements. Horatio Hornblower: this is written simply to introduce the British sailor of the same name. Maria: Hornblower’s first wife, whom he did not truly love but married because he did not want to break her heart by telling her that he didn’t love her; she eventually dies. Mr. Bush: a musical picture of Hornblower’s first mate, Mr. Bush. Rendering Honours: refers to two ships passing and playing the each other’s national anthem. In this case, the British national anthem is played, God Save the Queen (the tune of which is familiar to most American’s as My Country, ‘Tis of Thee). Be the first to review “The Hornblower Suite” Click here to cancel reply.